What happened to the Aussie attack? They were revered as one of the most potent bowling attacks in world cricket. 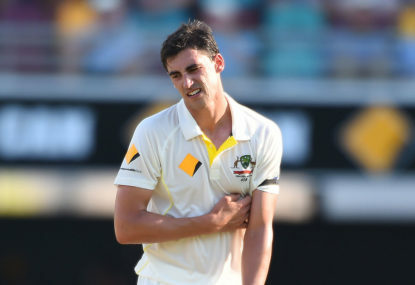 However, for the past six Tests, it has been revealed that troubling times are ahead for Australian bowling attack. He may, or may not have. We will never truly know. One thing I do know is that anyone who says they played during the 90’s and doesn’t remember a sledging and win at all costs culture are lying or suffering from amnesia. The fact that CA have adopted ridiculous slogans such as “elite honesty” and “make Australians proud again” proves that a significant rebranding effort is taking place and with it, a massive cutural shift. I’m just saying Australia are not ready for that yet and the latest set of results proves that. I wonder what Lillie, McGrath, Thomo, Hughes think about this PC rubbish. 80’s and 90’s Rob. You know, Lillie, Pascoe, Thomo, Hogg, McDermott, Lawson, Hughes, Reid, McGrath, et, al. Surely you remember the win at all costs mentality that was entrenched in the tea, back then, even if it meant, cheating, lying and playing outside of the spirit of the game, you know like the ‘under-arm’, Dyer’s ‘catch’ down leg, ‘Waugh’s ‘don’t walk if you nick it’, et, al. It truly fascinates me how fans like yourself refuse to acknowledge the cultural shift Australia are currently going through. Is it because you are ashamed of the way the team conducted itself in the past? All I can say is that it worked wonders for you. For nearly two decades they dominated world cricket. Yes there were expectional and once in a life time talents, but they also operated within a win at all costs framework too. I’m old enough to remember seeing froth and vitriol drip from the mouths of Pascoe, Lillie, Thomo, Hogg, McDermott, Reid, Hughes, McGrath etc, so yes I am able to compare the current crop and culture with the that of the past and no it wasn’t the stuff of faiytales and folk lore. It was real and it was awesome. Can’t imagine Lillie, Thomo, Hughes, McGrath being restricted to the PC culture currently espoused by the current crop of players and expect by the ACB. Since we’re on the subject of culture I wonder why you all of a sudden appeal to the return of the days of Border and Waugh, et al? Surely you realise those guys built their empires upon a “win at all costs” culture, including if it meant cheating and lying and playing outside of the spirit of the game. Greg Dyer’s ‘catch’ down leg, Chappel under-arm, Waugh’s ‘don’t walk if you nick it’, Lillie’s histrionics ring a bell? The point is this, Rob, the new PC approach is very un-Australian and it appears not to be working. A return to the old paths and dark arts is what Aussie need to do to become winners again. I miss that mongrel. Rob you’ve obviously had little to no experience playing the game have you? If you did you would appreciate the psychology behind sledging [verbal abuse] and the advantage it gives to the feilding team. Why do you think all of the great Australian teams of the past were proficient sledgers? But that’s just analogous to the main point. The main point is that Australia are going through a cultural shift and its taking them to a place they are far from comfortable with, a place that is respectful, transparant, honourable and nice. It’s a far cry from the good old days of swearing, intimidating, frothing at the mouth, headbutting, verbal abuse, etc. Australia won’t ever return to the top until they get back to what they’re good at. Tell me Frazer, since they were caught cheating in Africa and were forced to confront their ‘cultural’ issues what kind of results have the team had? To say this has nothing to do with the change of culture is simply a state of denial. It’s fascinating to see them go from the frothing, spitting, head butting, swearing, sledging fast bowler to smiling, polite, angels who ask if the batter is okay after every ball. Tell me Paul, what’s happened to all the angry, frothing, spitting, swearing, headbutting champion fast bowlers Australia used to produce? I kinda miss them and I bet most of Australia do too. At least that’s what the results are proving. “I have been bitterly disappointed watching the Australian cricket team over the last few years. The behaviour has been boorish and arrogant. The way they’ve gone about their business hasn’t been good, and it hasn’t been good for a while.” –Mickey Arthur. “We just got a little bit wrapped up in our self-importance. We should think of others more” — Tim Paine. I could go on, Gilchrist, Border, Waugh, Ponting have all stated that the culture needs to change, but I guess Paul that’s not enough for you so go back to living in denial. You never addressed the point in your first reply Paul and your dismissive attitude in your second reply shows you are completely clueless about the change of culture in team and the negative impact it is having on the attack. You’re simply in denial but that is to be expected I suppose. PS Those two were never in the running anyway. @ DJDJ – Analysis? Dead wickets yet 3 results? Bowlers are buggered, yet this is what they’re paid to do? Form? That’s not saying anything we don’t already know. Indian batting? Yet you rolled them in Perth. All of that is simply surface stuff that everyone knows. Not much of an analysis. The problem is much deeper than what you assume. Dig deeper. It’s a culture problem. Put simply Australia are struggling to come to terms with new PC approach to the game. Until you master that or return to the old “win at all costs” mentality Aussie are screwed. You obviously missed my point! The missiles are certainly there but the new PC culture surrounding the team isn’t doing you any favours. It’s akin to firing missiles from a bb gun. Its very un-Australian and you sense the attack is fed up with this softly softly lovey dovey approach. As an aside three players the rest of the world are happy not to see in the test team are James Pattinson, Glen Maxwell and Joe Burns. What if I told you that the Wallabies will win the William Webb Ellis Trophy? You heard it here first. 1. Shift in culture – no longer a “win at all costs” approach has really hurt their attack. You sense they want to sledge, bite and bicker to get under the batsman’ skin but they are obviously under strict orders not to. Its very un-Australian. Remember its called an attack for a reason. 3. No Sandpaper. Where is the prodigous reverse swing we were so used to seeing? 2017-18 Ashes ring a bell?